45 minutes have gone ever since the start of the race. Swimming conditions are apocalyptic. My little sister woke up at 5:30am to come and see me. She is here, waiting at the finish of the swim leg. Only problem: she can’t see me. She knows it takes 23 to 25 minutes to swim 1500m so she worries. She can see other swimmers, completely lost, swimming towards Africa so she worries. Then suddenly, a guy with a white cap comes closer…breast-stroking! My little sister is not a swimmer but she knows that if you end up breast stroking, it means you had a problem on the way. My sister can now see the white cap guy and she thinks she can recognize my jaw. So, she dares…to raise her arms to say hi. The white cap guy looks at her and she’s reassured. Then, he gets out of the water and my sister gets it. It’s not me. 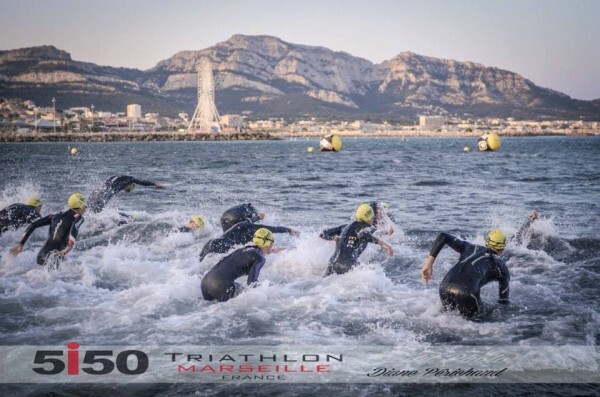 Welcome to Marseille for my 4th race of the season. The alarm goes off at 4am and damn, I don’t feel like it. I’m tired. I need to sleep. I worked like crazy this week and I probably had an average of 7 hours of sleep per day. 24 hours ago, I went on a “fix everything you can in the house” marathon and now my legs are heavy. I get out of the apartment and can feel the strong wind against my legs and I can already imagine how messy the swim is gonna be and how dreadful the headwind is going to feel on the bike. You got it. I’m not gonna set a PR today. I am in the transition zone. Everything’s fine but I am cold. It’s definitely not easy to be mentally ready for a B race. You can understand how professional athletes are not at the top of their game every time. Are you at the top of your game every time? You must be angry the whole wide world to deliver you’re a game every time. I’d have to hate you to be at the top of my game all the time. From that point on, I was all in. I had found someone to hate today. I am at the swim start and this sea, I’m gonna rip it. It’s a B race so I will take more risks today and swim aggressively. I think that in Geneva, I had started too soft. Too much focus on amplitude kind of swim. But today, strong swim. Make it or break it. Recently, I listened to a podcast with a Pro Australian triathlete who says that the only thing he focuses on at the swim start is his “9 first strokes”. He thinks about where he wants to be after those 9 strokes. He says these 9 first strokes are all anaerobic. He doesn’t breathe. If he executes well, he’ll be slightly away from the slower swimmers and he’ll be ahead, ready to draft the stronger swimmers. The gun goes off and I sprint to the water. When my face hits the water, my goggles go down all the way to my mouth! Nevertheless, I don’t give a d*** and focus on my 9 strokes. I put my head underwater, goggle less and go 1, 2, 3, 4, 5, 6, 7, 8, 9 and go back up. There is space around me so I lightly put my goggles back on. 30 seconds later, another swimmer goes by and hits one of my glass. My goggles are now perfectly adjusted! As planned, I am swimming strong. Conditions are tough. During the 2014 edition of that race, I had swum in 28’30 and knew that when you swim back to the shore, the sun blinds you and you can’t see a thing. So this time, I pay double attention and lift my head twice as much as usual. Unfortunately, the only thing I see is waves. No yellow buoys and not even another swimmer. Therefore, I trust my instinct and keep swimming. My swim wasn’t probably pretty but I finish strong oin 23’09. More than 20 minutes in front of the white cap guy who gave hope to my sister. I mount my bike and get ready to rumble. Right then, I know I had a good swim because there isn’t another rider around me. I am at the bottom of the Gineste, a 4km, 7% clim and the pros are not back yet. The climb is 4km long and my plan is simple. The first 2 kilometre at 152 bpm and the next 2 at 158. I don’t wear my heart rate monitor during the race but I know exactly the differences between 152 and 158. During the first 2 km, I overtake one guy who overtakes me a minute later and that I overtake again another minute later. Then he comes back, unfortunately for him, when we hit the “2km to summit” sign. I see the sign and tell myself “158, let’s go”. My coach told me that a great downhill was key here. Back in 2014, I rode the 40k in 1h21 without any aero bars. Here, I am 50-60km/h, down on my bars. However, in the curbs, I still tend to use the brakes too much. Still to improve. I finish the bike in 1h14. First 2 kilometers at 175 bpm. From KM2 to KM6, tempo, at 168. Last 4 KM, all out. In the last km, I am all in. I know it’s gonna hurt and that my body will tell me to stop but I ignore it, I ignore it, I ignore it. My stomach hurts everywhere. I probably have 8 stomach aches now. It’s the last curb and there’s one guy 5 small meters in front of me. I start to sprint. I reach his level…then he drops me. I finish the run in 39’27, 45 seconds slower than in 2014. I finish the race in 2h18’52”. That’s 16 minutes faster than in 2014! 7 minutes away from the podium and 3 minutes from the last pro. Damn, it feels good to see all the hard work pay off. My coach once told me that sport is a fair world because if you work hard, one day, it will pay off. He also says that you have no freaking idea when it’s gonna pay off but one thing’s for sure, one day, it will pay off! I would have liked all my hard work to pay off at the European Championships in Geneva. Actually, I would like to see the results of my hard work everyday, during every training session. But apparently, this is not how it works. For me, hard work paid off today. The ranking is here. 72nd overall and 8th in my age category. First time ever in the top ten! Yes baby! So Mr Weather? Who’s soft, now, uh? Got something’ to say? Right now, I am in the passenger seat of my car. My brother’s driving. Tomorrow is the next race. And what a race it’s gonna be: The Alpe d’Huez triathlon. 1,2k swim in a 15 degree water, 30k bike including a 15k climb and a 7k run at 2000m of altitude. And you? Who’s soft in your life? In your current project, who’s soft? Tomorrow at training? This thing messing with your head at home? Uh? Who’s soft? Go Hard! You’re Top Ten too.